Currently Associate Professor of Violin at Lawrence University, Samantha George served as Associate Concertmaster of the Milwaukee Symphony Orchestra from 1999-2008 and as Acting Concertmaster of the Milwaukee Symphony Orchestra for the 2002-2003 season. 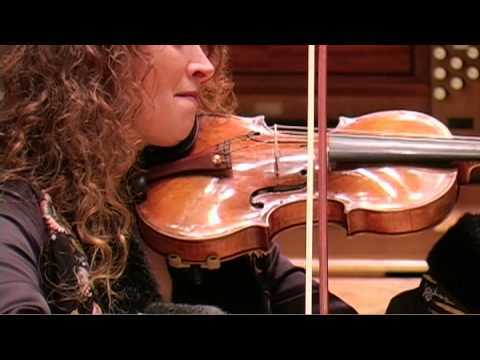 While a member of the Milwaukee Symphony Orchestra, she performed as soloist alongside world-famous violinist Hilary Hahn (Bach Concerto for Two Violins). Her previous orchestral posts include Assistant Concertmaster of the Colorado Symphony, Core Concertmaster of the Hartford Symphony, and Guest Concertmaster appointments with the Charleston Symphony and the Oregon Symphony. She has performed at the Grand Teton Music Festival, Norfolk Chamber Music Festival, Heidelberg Castle Festival, and the Washington Island Music Festival, where she is also the Artistic Director. As a soloist, Dr. George has performed with the Milwaukee Symphony Orchestra, Milwaukee Chamber Orchestra, Raleigh Symphony, Idaho State Civic Symphony, Hartford Symphony, and the United States Coast Guard Band. Dr. George received a high-school diploma from the Interlochen Arts Academy and Bachelor of Music, Master of Music, and Performer’s Certificate degrees from the Eastman School of Music, where she was a graduate teaching assistant for Charles Castleman. She holds a doctorate in violin performance and music theory from the University of Connecticut. Active as an advocate for greater understanding and appreciation of classical music, Dr. George is a host of Lawrence University “Live from the Conservatory” webcast intermission interviews, teaches music appreciation courses at the Washington Island Music Festival and presents pre-concert talks wherever she performs. George received the 2012 “Excellence in Teaching: Young Teacher Award” from Lawrence University.